Mispricing causes a divergence between the market price of a security and the fundamental value of that security. The law of one price states that the market price of a security is equal to the present discounted value of all cash flows generated by the security. However, it is not always the case as asset prices can sometimes diverge from their fundamental values. The divergence can be due to a financial crisis or a current event in the economy. While the shifts in asset prices can lead to arbitration opportunities, they also help economists understand what causes the mispricing of the asset. It can be due to a macroeconomic issue such as financial or capital institutionsKey Players in the Capital MarketsIn this article, we provide a general overview of the key players and their respective roles in the capital markets. The capital markets consist of two types of markets: primary and secondary. This guide will provide an overview of all the major companies and careers across the capital markets. that trade the assets, or it can be due to the specific characteristics of the individual assets at the microeconomic level. The probability that an asset is mispriced increases with the total number of mispriced assets in the market. A lot of commonalities exist between the deviation of asset prices and their fundamental values. With mispricing, there is a level of systematic riskSystematic RiskSystematic risk is that part of the total risk that is caused by factors beyond the control of a specific company or individual. Systematic risk is caused by factors that are external to the organization. All investments or securities are subject to systematic risk and therefore, it is a non-diversifiable risk. for investors in financial markets. Along with the systematic risks, mispricing can cause detrimental effects in markets through the destabilization of dealer funding costs. 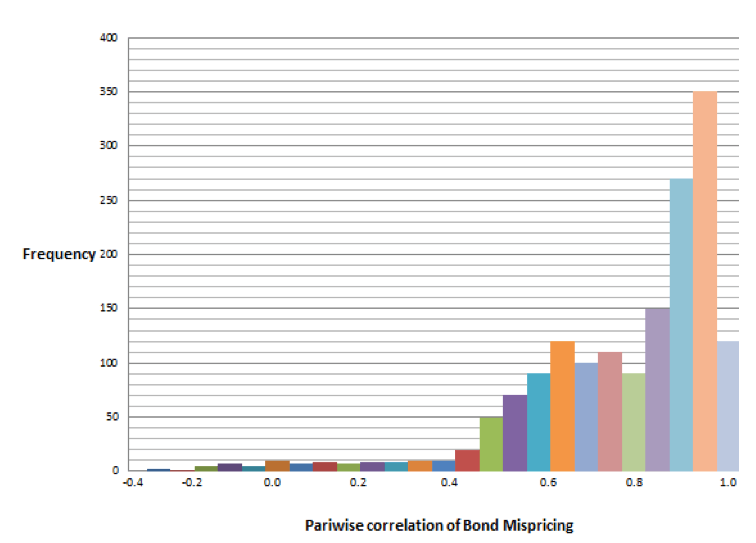 The direct correlation between mispricing and dealer funding costs shows that investors face capital constraints in financial markets. The constraints are the primary reason for the mispricing of stocks in the market. Although the one price principle states that asset prices should be equal to the present value of future cash flows, mispricing proves that asset prices are often driven by factors that are unrelated to the cash flow or discount rate of the securities. The ability of the participants in the market to obtain capital is a major reason why asset prices can be different from their fundamental values. The lack of funding causes assets to function independently from their fundamentals and does not allow the investor to arbitrage the mispricing. The slow movement of investment capital to the number of trading opportunities is a cause for mispricing. Sometimes, the arrival of capital to meet an investment opportunity can be delayed by a few seconds (an equity market) or by a few months (risk insurance market). Either way, it creates demand and supply shocks in the market because there is too little capital available to absorb the shock. The shocks cause asset mispricing in the economy. Eventually, the capital will enter the market to meet the investment need and the asset mispricing will be reversed. Many theories suggest that there is a direct correlation between asset prices and the capital provided by financial intermediariesFinancial IntermediaryA financial intermediary refers to an institution that acts as a middleman between two parties in order to facilitate a financial transaction. The institutions that are commonly referred to as financial intermediaries include commercial banks, investment banks, mutual funds, and pension funds.. In such a case, asset mispricing can be caused when there are constraints on raising capital through the sale of shares (equity capital). For example, an arbitrageur can provide liquidity to other traders who are looking to reduce risk exposure; however, if their ability to provide insurance is constrained by equity capital, it can exert a large impact on the asset prices. While the theory is similar to funding liquidity in terms of capital constraints, the key difference is the way the capital is raised. Funding liquidity refers to debt capital constraints, while intermediary capital refers to equity capital constraints. Illiquidity refers to the inability to sell stocks or shares without suffering a major loss. It can contribute to asset mispricing. Investors often incur high transaction costs while trading securities. This creates a difference between the cash flow of the security and the amount of money the investor actually receives. The disparity can affect the market prices of stocks.